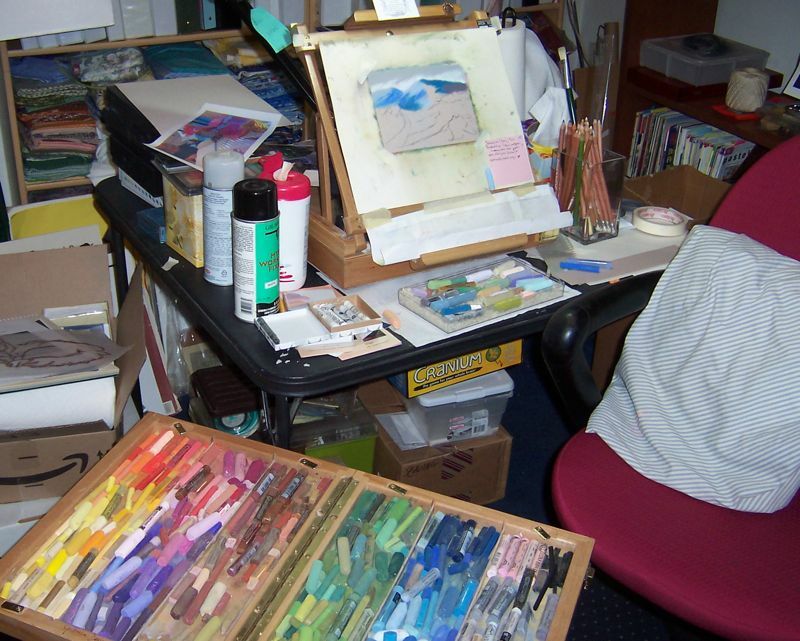 For this post, I moved my box of pastels divided by color and value around to the front of the table where I normally site. I have probably 6 different brands represented in the collection. Some pastels are softer than others, some offer colors the others don’t have, etc. so I like having a lot of choices. I just counted 58 blues, however there are others in boxes that I have recently purchased and aren’t represented here. 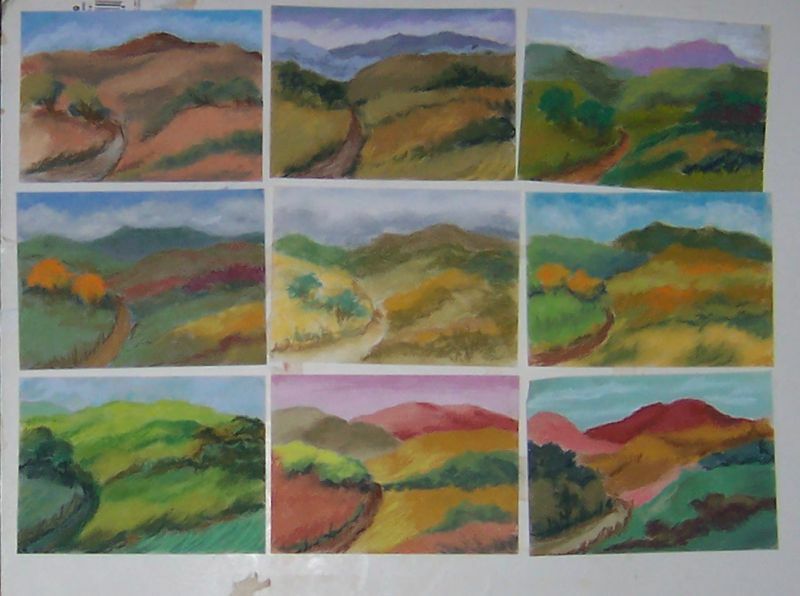 They are divided into 8 color groups, therefore………if my math is correct, I have around 500 different pastels. Not sure what the count would be adding in the boxes hiding behind my table easel. I’ve turned the chair around (note the pillow for my back!) and pulled the pastels to the side for a different view. 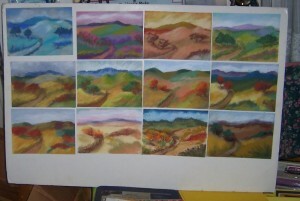 The pastel tray is usually running parallel to the table so I can just reach with my left hand for a color. You’ll notice a small box of pastels just next to the front edge of the easel. It has a layer of rice in it and as I use a pastel in a painting I return it to this small box, not the big one. 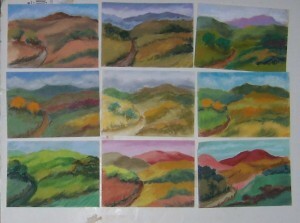 It’s a way of keeping track of the colors already in use, as well as being able to repeat a particular color in another place in the painting without searching madly for it in the big box. 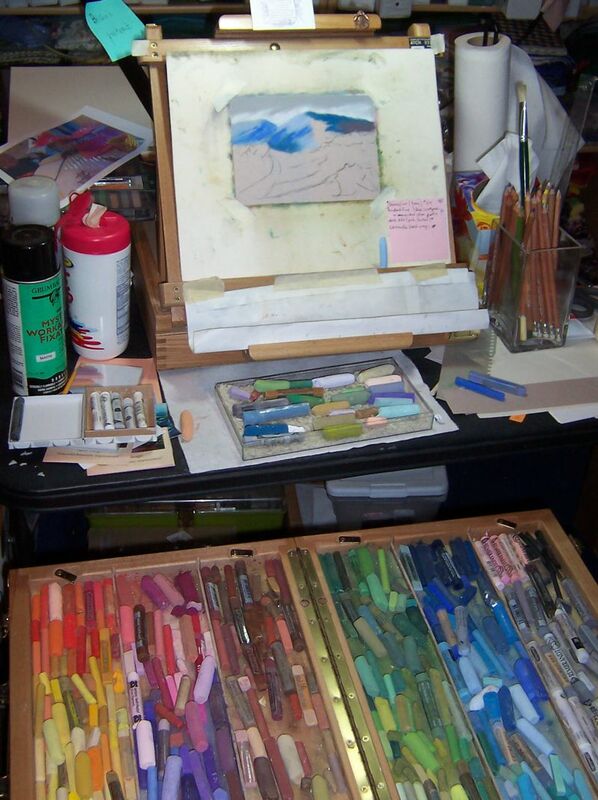 The rice helps hold the pastels away from each other, but I still have to clean them as I pick them up usually. 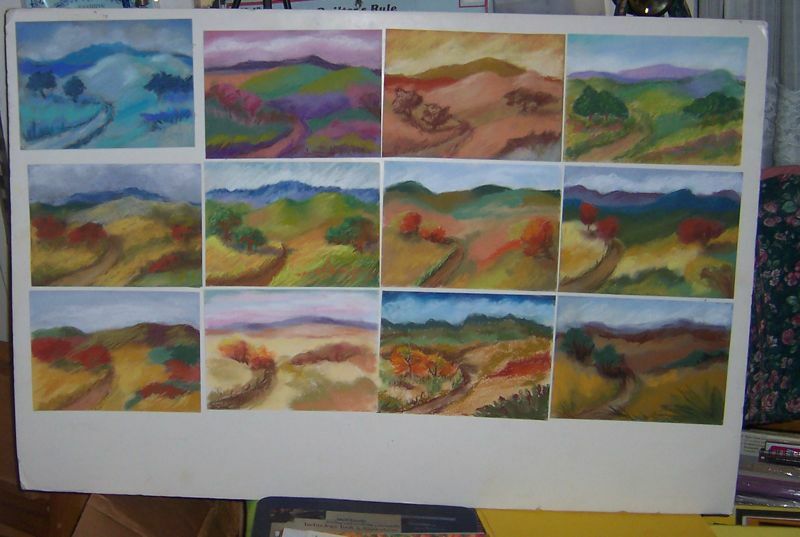 Here are pictures of two of the poster boards I use to mount the completed paintings. They are propped up on books and a stand on the far side of the card table so that as I’m working, I can check and make sure I’m not duplicating anything. As the number rises, I’ll have to rely on photos for that process as I won’t have room to stand the poster boards up after about another 9 pantings. This entry was posted on Wednesday, February 23rd, 2011 at 6:55 pm	and is filed under 100 Pastel Challenge, Color, Landscapes, Paintings, Pastels. You can follow any responses to this entry through the RSS 2.0 feed. You can leave a response, or trackback from your own site. It’s fun for me, especially, for knowing you to see your set up. Very practical and useful. You must have a fortune in pastels! Well, I sure take advantage of as many sales as posible! I’m slowly working to make this room a “studio”. Hopefully, I’ll soon be able to take a picture of my studio easel and a tall stool. Shelves of just art related stuff…….you know, you have to dream big to get anywhere at all. I love seeing the workspace almost as much as the work! The tray of pastels especially appeals to me. I love the “organization” of it! Then to wander my eye over the uniqueness of each color within the color. I’d have trouble working in your space because I would be knocking things over all the time.